Mantra Jewellery have joined together with the mental health charity, MIND, who supports and champions people with mental illnesses. The charity has a key aim of encouraging people to talk about mental illness, by finding the right words, and by removing the stigma. Celebrate their partnership with the mantra 'I am strong enough to stand alone, but wise enough to ask for help'. The 925 Sterling Silver necklace carries the word 'Strength' and features the iconic mantra lotus. Available in 925 Sterling Silver or plated in either 18 carat Gold or Rose Gold. 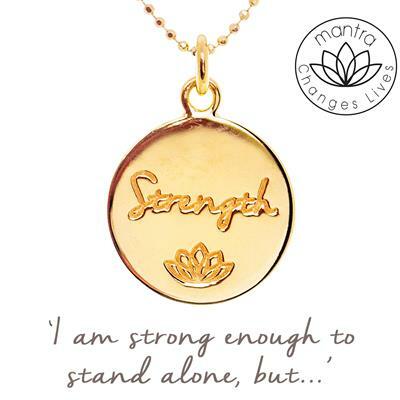 25% of each sale of the Strength necklace goes to MIND to help fund their amazing work. This item can be engraved on the reverse of the pendant.